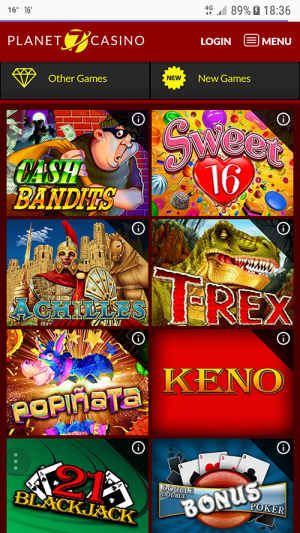 Planet7 has a checkered past of being one of the flagship casinos of the Ace Revenue group of casinos. They were in the rogue pit for a while – then out – then in again. Since the move, we have had a number of complaints mostly unresolved payment issues. 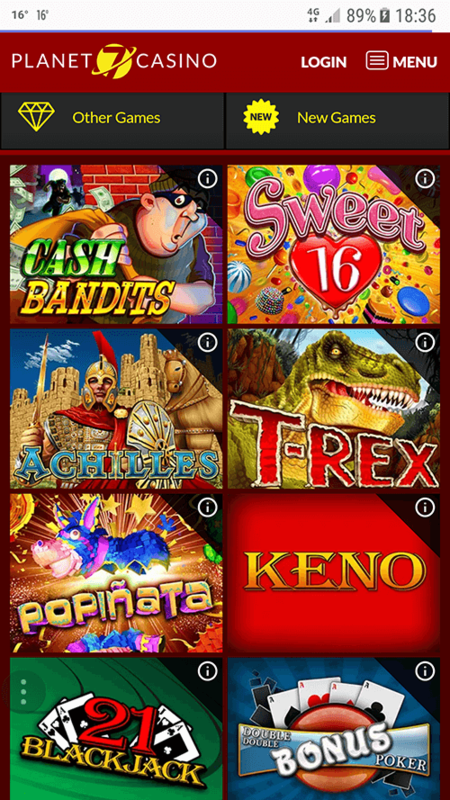 There are better RTG casinos to be found – this obviously is not one of them. Panet7 has the full catalogue of Real Time Gaming games. Too bad if you win anything, you may have to wait for months to be paid. Planet7 has all the RTG mobile games you need. But if you win anything, don’t expect to get paid. In April of 2017 I won a approx $16000 at Planet7. A Bonus Coupon was used initially, and the initial deposit was $60. The Coupon had a no-limits cap and a max cashout of $35000. So, I played thru a large amount and at the $7500 mark decided to withdraw the funds. 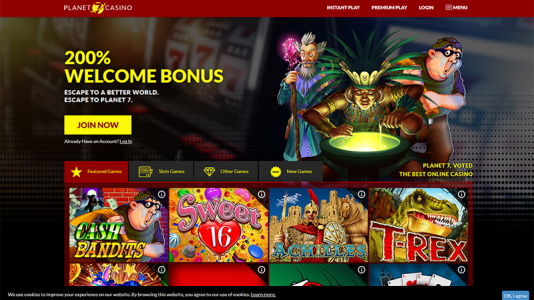 The casino has a max withdraw of $2500 at a time and according to their website the payouts would be weekly. I made three max. withdraw requests, each for $2500, with the expectation that once the withdrawal was approved, i would receive 3 x $2500 payout on consecutive weeks. The withdrawal request sat in my account for about a month, when finally i was notified the the withdrawal was approved for the sum of $7440 on June 13. The funds where removed from my account and the initial deposit was subtracted from the cashout – as stated would happen in their terms and conditions. I have made several chat session contacts regrading this withdrawal, but according to the terms and conditions, I should wait at least 20 business days before pursuing the withdrawal further – so I did. July 11 I resumed the discussion. I have spoken; via chat, with several different agents, all acknowledge the withdrawal is approved and waiting for their finance department to process the withdrawal. In each case I was told they would escalated the request. When I contacted another agent a couple of days later, was told the request was not escalated and the agent said they would escalate it with no explanation why it wasn’t done with the previous agent – after being told it was escalated. In the last week, on Monday, I phoned customer care, the agent reported the request not escalated and he said he would escalate the request and that the payment should be made in the next payment cycle which was on Wednesday or if it didn’t make that payout then Friday – maybe. Wednesday came and went, so I contacted customer care; and they verified the claim was escalated and to be patient – high volumes have delayed payouts, but everyone will get their money. Friday came – still nothing. I seem to get the same answer every time, and not making any progress. On May 1st I played and won. I had a $5000 balance. I requested two $2500 withdrawals (as that is their max). The first thing they did is demand that I update my documents with them (which were already approved). I had JUUUSST done this recently and they ask every single time. Its absurd but I did it anyways. They kept telling me to update them and I showed them the recent correspondence that they had already received them a few days earlier. This went on for a long time. Finally, they went in and manually denied both of my cashouts then requested 5 separate for $1000 each. That is not what i wanted! firstly, they charge a fee for each transaction. secondly, I knew it would take the better part of a year or more to get paid. Thirdly, I told them i am a bit weak and didn’t want to gamble and if it was in my account that i would be tempted. They did it anyways. When I contacted to complain they said “company decision”. When i asked where it was in their T/C to do such a thing they stated that I was lucky to have it approved and eventually I would be paid based on management time frame. Well, I know myself and i was so angry that I went and played with it like I didn’t want to and lost it all except for $1000 that was approved to be paid. They knew darn well that would happen and did it anyways despite my asking them not to. That $1000 STILL has not been paid 3 months later. The casino rep hasn’t responded to my messages (which were admittedly scathing bc they knowingly keep messing with me and my cashouts). Live chat keeps saying they will send it to an ‘escalation dept’ , which is absurd and an outright lie. They say the same thing each time. I still have not been paid at all and there is no urgency in sight. I am owed three approved withdrawals from Planet7 that are very past due. I have communicated over and over again with the VIP hosts via chat. I used to try to contact them via email, but they do not respond to emails. My emails go into a black hole. The VIP chat hosts say that chat with them is the best way to correspond. I am owed $3,937 in three payouts. Two of these are over 60 days old. Specifically, a withdrawal of $200 was approved on May 2. A withdrawal of $2,051 was approved on May 11. A withdrawal of $1,686 was approved on June 13. I have communicated with Planet 7 VIP hosts via chat over and over again, and I have been told 4 different times that these payouts have been escalated. Yet, I have not been paid. On July 2nd I was told via chat that if I made a deposit, that would help my escalation of payments. This sounds like fraud to me. Today, July 11, I was told the payments will be escalated to finance to be paid within 7 to 10 days. This is the same information I was told a month ago. I appreciate whatever assistance you can provide to help me recoup my winnings. Just way too many complaints. I would recommend avoiding this casino until the fora is vacant of all ongoing complaints.